Among those leading our amazing staff of instructors is studio co-owner, Michelle Long. Learn more about Michelle below. Q: What led you to Pilates? 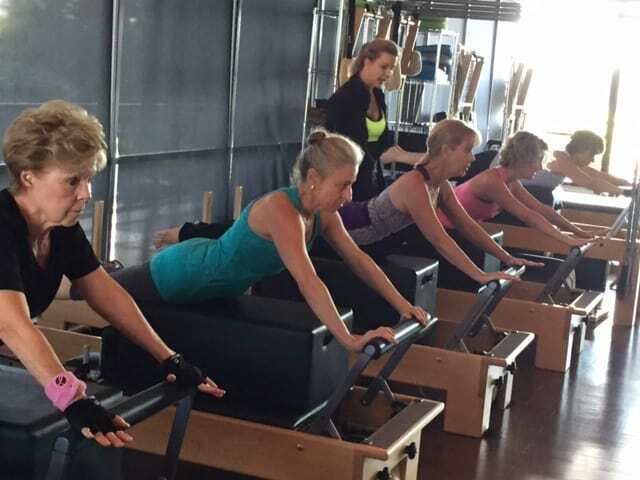 A: I tried a 30 minute Pilates Reformer class and Wow! I loved the combination of strength and stretch. I moved in a way I hadn’t since I was a child. I immediately got certified and opened my own business in 2004. I have been teaching ever since. Q: What are your specialties or what is new in your practice? A: I recently have been going through Myofascial training with Karin Locher from the UK. I apply the Myofascial teaching to the Pilates movements. Learning how to move through our body’s natural ability or “Tensegrity”. I now move much easier and with much less effort or tension. Q: What changes do you enjoy seeing in your clients? A: Freedom of movement, no longer “muscling” through exercises, pain free range of motion, doing more with less effort. I love to see them feeling younger everyday. A: Yes!!! I enjoy teaching both men and women . More and more men are showing up in our studio. Afterall, Joseph Pilates did create Pilates to be an exercise specifically for men. Q: Why is it important for beginners to take private sessions? A: My goal is for everyone to move safely, comfortably and confidently. It generally takes 3 private sessions to learn the Beginner Pilates repitoire. Everyone, then, has a chance to do all the exercises and learn any modifications. Then when they go to classes , they feel they are ready. Q: Do you teach classes? A: Yes. All of our classes are leveled to accommodate our clients abilities. I now teach Fascial Flow PIlates classes. Combining Myofascial teaching with the Pilates exercises. Q: What is your favorite Pilates equipment and why? A: I love the Reformer. I like the way the springs assist the movements to make them easier or harder.I can lay down, sit or stand on the equipment while I make it move underneath me.It challanges my strength, balance and flexibility. The variety and long list of exercises keep it fresh and fun. Q: What Pilates exercise challenges you most? A: Snake and Twist on the Reformer tests my entire body! And how about we add a twist to an already extremely challenging exercise! Q: What makes Pilates FUN? A: The changes that are created in your body. The vast variety of equipment and exercises. Working out with other people . Mostly , I enjoy the accomplishment of doing something I couldn’t before!